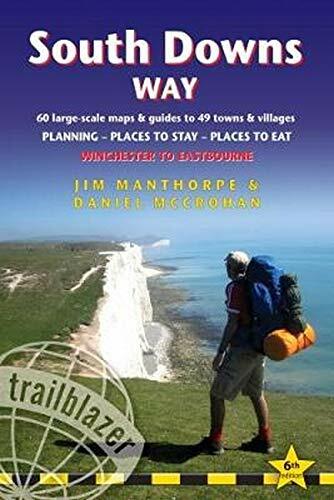 The South Downs Way is a 100-mile National Trail footpath which follows the line of chalk hills stretching from Winchester to Eastbourne in southern England. Walking the length of the Downs is the best way to experience this beautiful landscape with its mixture of rolling hills, steep hanging woodland and windswept fields. You’ll also pass through picture-postcard villages with welcoming pubs, thatched cottages and country gardens. * 82 Maps: 60 large-scale walking maps – 1:20,000 (3-1/8 inches to 1 mile) – the largest-scale maps available, 11 town plans, 10 stage maps with trail profiles showing hills and descents, and 2 overview maps. * Detailed accommodation with reviews: B&Bs, campsites, pubs, hotels, bunkhouses. * Where to eat with reviews: cafes, teashops, pubs, takeaways and restaurants. * Comprehensive public transport information with frequency of services for all access points on the Path. * Itineraries for all walkers, whether hiking the entire route or sampling highlights on day walks, weekends or short breaks. * Unique mapping features – walking times, directions, tricky junctions, places to stay, places to eat, points of interest written onto the maps.